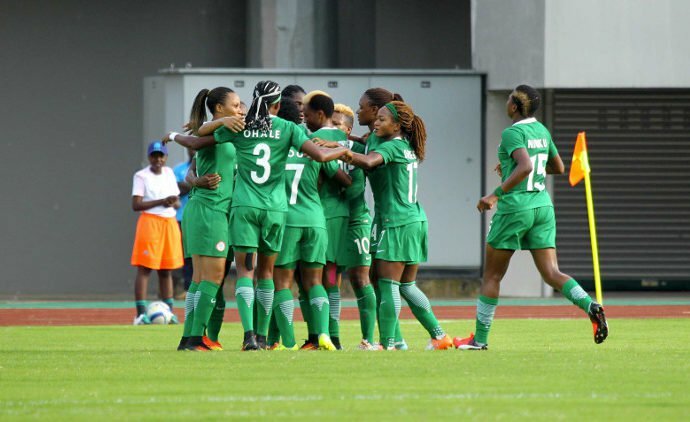 Nigeria swept to her eighth Women Africa Cup of Nations title after powerful forward Desire Oparanozie struck with four minutes left on the clock to ensure the Super Falcons retained their continental title in a fully packed Stade Ahmadou Ahidjo in Yaounde on Saturday. The Cameroonian Lionesses, who lost 2-0 to the Falcons in the final of the 2014 edition in Windhoek, Namibia dominated play from the beginning but were profligate in front of goal. As early as the 4th minute, Gabrielle Onguene ghosted past the Nigerian defence, only to shoot wide with just Goalkeeper Alaba Jonathan to beat. Lively midfielder Ngozi Okobi however stood out in the Falcons’ side despite Nigeria’s slow start to the game. She found space in the middle, and then turned brilliantly only for her shot to go too high and completely off target. Enganamouit, reigning Africa Player of the Year was, as expected, a threat to the Nigerian defence, as she made frantic efforts to ensure her team take the lead. But for goalkeeper Jonathan's brilliance, the Cameroonians would have matched her pre-final macho talk. Chance after chance fell to the hosts, with Ngono Mani, Ngock Yango, Gabrielle Oungene and Gaelle Enganamouit all having four clear shots on target as against none for the Super Falcons in the entire first half. The game was contrast of what the Falcons had shown all through the championship, as they were a shadow of themselves in Yaounde. Nigeria's attack led by Arsenal Ladies' Asisat Oshoala barely had a charge at goal let alone aim at goalkeeper Ngo Ndom. In the second half, the Falcons faced a more serious charge from their hosts, but a super defensive display from the duo of Onome Ebi and Osinachi Ohale ensured the game stayed scoreless. In the 57th minute, a rather poor Asisat Oshoala not playing at her best, lost the ball in the midfield allowing Onguene to launch another onslaught on the Nigerian defence, but Jonathan again saved Nigeria’s blushes. Chioma Wogu was thrown into the fray to replace Washington Spirits' Francisca Ordega in the 65th minute. The change brought pep and some urgency into the fore of the Falcons, with Oparanozie getting the needed support she so much craved. The Falcons finally got the game's only goal, the Cup –winning strike coming in the 86th minute when Desire Oparanozie met up with a lob from impressive Ngozi Okobi, and she coolly slotted home. The goal was greeted with total silence inside the Stade Ahmadou Ahidjo, filled to its over 40,000 capacity. Ghana, whose Black Queens won the bronze after pipping South Africa on Friday, will host the 2018 Women Africa Cup of Nations finals.